The man who destroyed President Donald Trump’s star on the Hollywood Walk of Fame early Wednesday has already turned himself in to the authorities. The man walked up to Beverly Hills police headquarters an hour after he committed the offense, identified himself and expressed his intent to give himself up to the authorities. LAPD officers took him into custody. He was identified as Austin Clay, 24 years old. Jail records show Clay was booked on suspicion of felony vandalism and is being held on $20,000 bail. 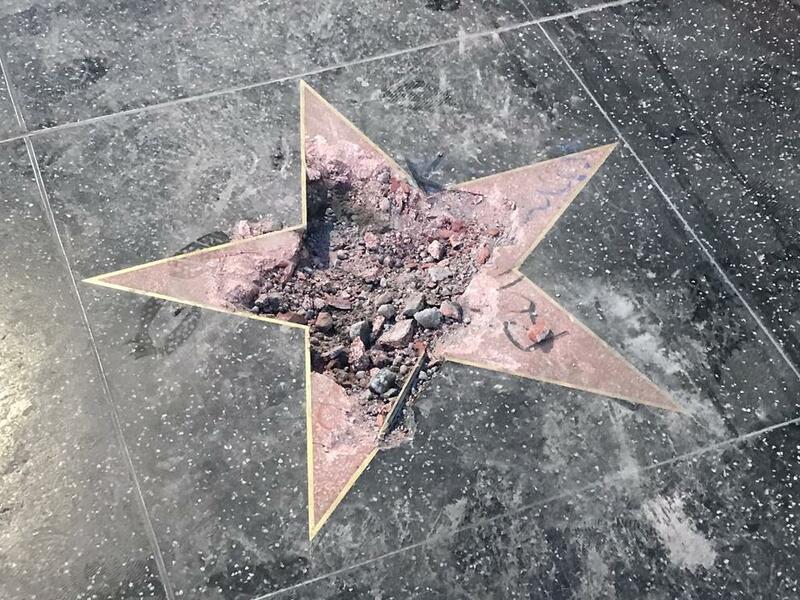 An hour before turning himself in, Clay made the news, albeit as still the unidentified suspect, after he took a pickax to Trump’s star on the Hollywood Walk of Fame on Hollywood Boulevard and Highland Avenue around 3:30 a.m., and destroyed most of the star, including bashing Trump’s name plate. Clay carried the pickax in a guitar case, that is why he managed to get near the said star symbol without rising suspicion at first. Private security officers in the area attempted to intervene but couldn’t really stop Clay because they don’t have police powers. A man was also caught on video bashing the star with a sledgehammer in October 2016. The man was charged with felony vandalism. Trump’s supporters condemned the act as another proof of the petty attitude and double standard of liberals. I guess this is the second time this creep has done this, no telling how far a deranged mind like his would take things. I think he should be visited by the SS. Also whatever punishment they gave him sure didn't have any affect. If I was his judge I would take that personal and throw the book at him. Maybe 10 years hard labor might straighten him out! A comment worth repeating ….More likely this just another Liberal-Democrat Politically funded stunt to deflect from all the official evidence being released that the Democrats tried to STEAL and Election and subvert an Elected President all for their Political purposes. Considering the cost of the item and cost of replacing it it could be a felony in Cal. Plus did I understand right he has done this before? Seems like he should be banned from the area now. Also was the last incident a Felony? If So what is his felony count 3 in Cal. is Life.